As part of its mission to create a dynamic waterfront, the Port of San Diego is presenting “Sojourner,” a temporary immersive artwork by San Diego artist Adam Belt. 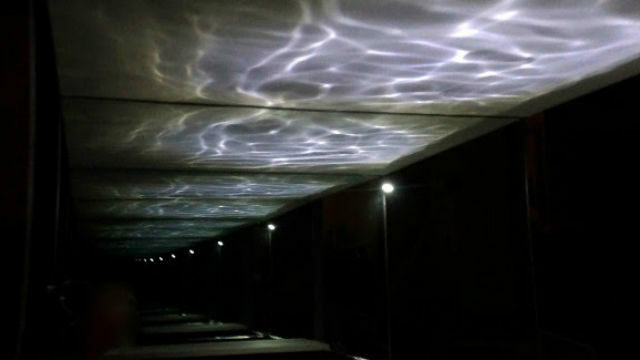 Inside a specially constructed space at the end of Broadway Pier, visitors can experience a meditative world enveloped in reflections. The artwork features a reflecting pool and opposing floor-to-ceiling mirrors that cast rippling light on the water’s surface out to an infinite horizon. The artist is represented by Quint Gallery in La Jolla and has exhibited widely across the country. His work is in the permanent collection of the Museum of Contemporary Art San Diego. Sojourner will be free and open to the public through April 29 on the pier at 1000 North Harbor Drive downtown.